Does welfare for workers subsidize Walmart? This is a claim that has become a popular talking point on the left: by paying workers so little that many of them qualify for things like medicaid, TANF, food stamps, and EITC, big employers like Walmart are essentially being subsidized by the welfare system. At over $446 billion per year, Walmart is the third highest revenue grossing corporation in the world. Walmart earns over $15 billion per year in pure profit and pays its executives handsomely. In 2011, Walmart CEO Mike Duke – already a millionaire a dozen times over – received an $18.1 million compensation package. The Walton family controlling over 48 percent of the corporation through stock ownership does even better. Together, members of the Walton family are worth in excess of $102 billion – which makes them one of the richest families in the world. Meanwhile, Walmart routinely blocks any attempt by workers to organize, using anti-union propaganda and scare tactics, firing employees without just cause, failing to provide any form of decent healthcare coverage or a livable wage. To make matters worse, these abusive Walmart policies have increased employee reliance on government assistance and the need for a government funded social safety net. In fact, Walmart has become the number one driver behind the growing use of food stamps in the United States with "as many as 80 percent of workers in Wal-Mart stores using food stamps." To be sure, I don't buy the values argument here. Yes, society does have a moral obligation to both ensure that everyone earns more than subsistence and to share prosperity as broadly as possible. Sometimes it may be more economically efficient to do this through policies that affect wages than through government-budgeted redistribution (though I will scrutinize your model if you make this claim), but I see no inherent moral reason to prefer redistribution through the market wage mechanism. Low wages supplemented by welfare is perfectly moral policy for low-skill workers, and the argument that Walmart is shamefully exploiting the welfare system only plays into the right-wing narrative that welfare is shameful and low-skill workers are icky. The left-wing attempt to vilify Walmart for hiring low-productivity workers only further vilifies low-productivity workers. @UpdatedPriors It seems reasonable and important to inquire as to whether wages are being suppressed by public assistance. Unlike the values claim before, this causal claim is within economists' domain. Welfare-for-walmart theorists believe that by keeping more workers from starving to death, welfare programs increase labor supply and thereby decrease the wages firms have to pay. Health economics research vaguely supports the broad proposition: social factors like income have big effects on health and we have every reason to believe that welfare assistance reduces the overall mortality rate so that there are, in fact, more workers with a welfare system than without. But, we're talking about effects on different orders of magnitude, and the welfare-for-Walmart claim--that all the workers would starve to death without public assistance--is not consistent with the research finding that lower incomes decreases life expectancy somewhat. I have no doubt that some Walmart workers go hungry sometimes, but the idea that most of them would starve to death in the absence of public assistance is pretty hysterical. The american poor still rank among the wealthiest compared to the long history of human subsistence. @ModeledBehavior @hyperplanes SNAP should raise reservation wages, while EITC opposite. Would be true in large class of models. Dube's argument here is that various welfare schemes each impose their own distortions on the labor supply decision--the EITC, for example, is essentially a tax on non-employment since you can't qualify without a job, while SNAP (food stamp) benefits which decrease as your market income rises is essentially a tax on working more. Certain kinds of tax distortions can drive a wedge in the capital/labor ratio and reduce long-run wages, but it's not guaranteed, so this theory is still missing something. 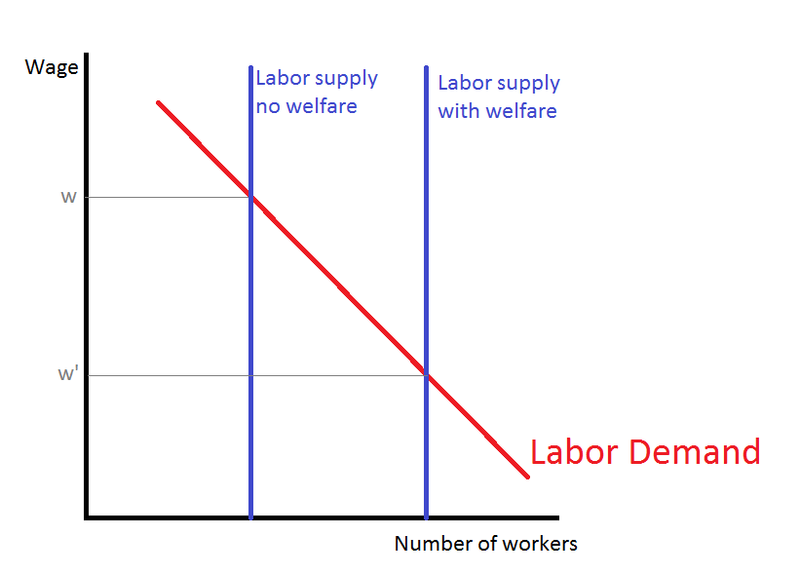 Moreover, while exact effects depend on the design of each program, I don't think it's controversial to say that the combined net effect of all these welfare programs is to decrease aggregate labor supply, which would tend to increase not suppress market wages. 1. To see why I make this claim, consider the DSGE model I posted previously. (I'm posting math as images with white text--if your using an RSS feed with a white background, click over here) The consumption Euler equation without distortionary taxation is , while from the firm's profit-maximization problem . That means the steady state labor/capital ratio, , is fixed by technology, time preferences, and capital depreciation. Also from the firm's problem, , with fixed L/K implies increasing labor supply does not decrease wages, except in the short-run transition phase. No doubt there are a variety of deviations from the standard model that would allow long-run wages to change, but, as always, if you don't present your model it didn't happen. We can't debate claims that aren't stated.